“The bigger the darkness, the easier it is to spot your little light.” (Brother Andrew, “God’s Smuggler”). 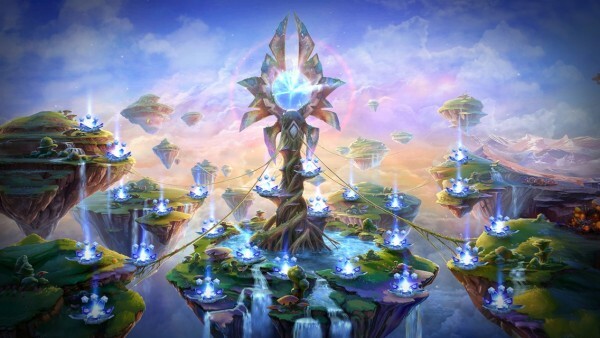 “God Of Light” is a puzzle game developed by the awesome little team over at “Eon Games” and published by “Playmous” that has players set off on an adventure to light up a once beautiful world that has been thrown into darkness by an unknown force obviously set on the destruction of a gentle peace. It is a game that boasts quirky puzzle-solving and brilliantly vibrant visuals, the likes of which any avid iOS gamer will love…or so they say. 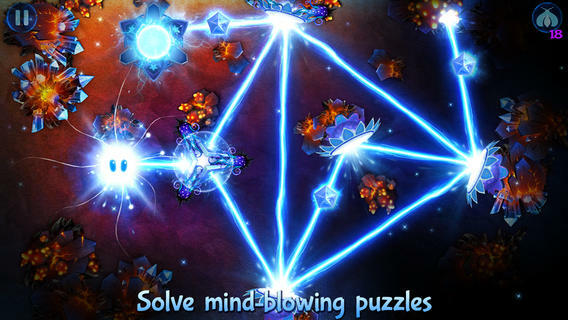 As far as puzzle games go, I really wouldn’t consider “God Of Light” to be anywhere near your average puzzle title. 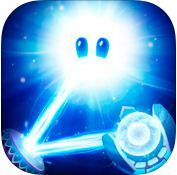 It has all the fundamental aspects of a good puzzler; challenge, quirkiness and a cute character to play as, but what “God Of Light” does is it twists and tweaks what is good about your typical puzzle game and makes it into something of its very own. I’m not saying it revolutionises the genre in any way but it definitely does something that I personally have never seen before and it does it well. You play as “Shiny”, a ball of light and what seems like the only hope left at lighting up this darkened world. As “Shiny” you use an array of mirrored surfaces to reflect and guide your beams of light around obstacles and to a structure called the “Source Of Light” which permanently lights up and brings back some form of light to the desolate world. Each level contains three crystals that can be lit up while trying to make your beam reach the “Source Of Life”, collecting all three crystals will simply award you a perfect level completion and, even though I’ve played through the game, I saw no reward for collecting each and every crystal. There is also a hint system within the game that comes in the form of fireflies. 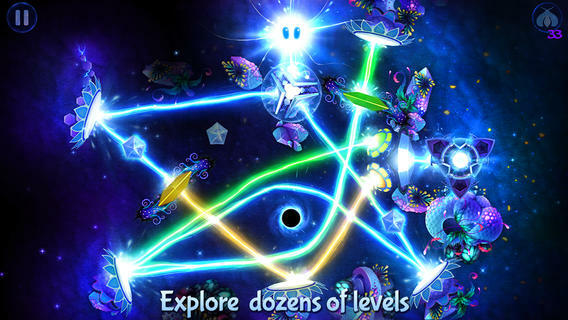 Alongside the three crystals, some levels will contain a firefly that you can light up. 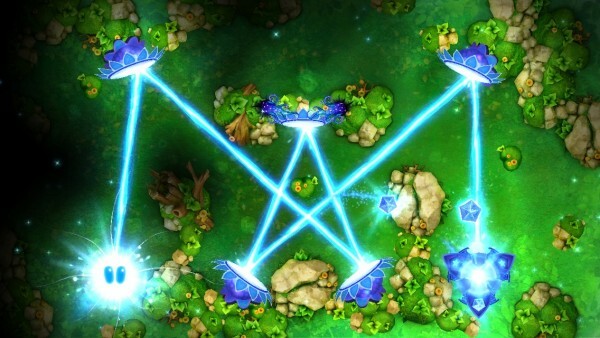 Doing so will allow you to use the dragonfly to give yourself a hint as to where you should line up the beams of light to complete the level perfectly. My favourite mobile titles are ones that are easy to pick up, easy to play and easy to put down when necessary yet deliver a level of thought-inducing gameplay to get one thinking just enough to get the brain juices truly flowing but not enough to spark frustration. 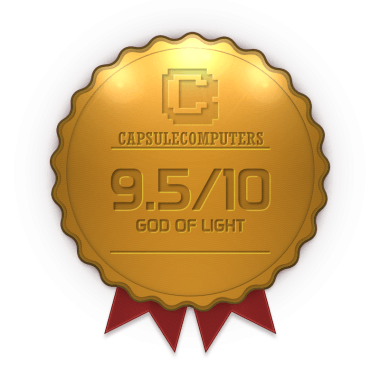 A great deal of GOOD games do this but some do miss their mark by quite a lot…luckily “God Of Light” does this very well! I think it is a perfectly balanced game that doesn’t demand too much from its player but also doesn’t treat its player like a brainless potato. The unfortunate thing is that they really give you no incentive for collecting each of the crystals within a level. I do it because I’m competitive in nature and I’d rather not let a game get one over me so I collect each and every one of them but I can’t see why others would do the same. “God Of Light” has an absolutely brilliant visual style, especially for a puzzle game. Using a theme revolving around darkness and light, you have to be able to make things visually murky and mystical yet also quite vibrant and beautiful, a few mixes that aren’t often portrayed within one title but when they are…they’re done damn well. Case in point; “God Of Light”. When starting out on a level the entire stage is covered in a deep, purple mist which scatters and reveals an essence of beauty below it, this is a fantastic example of what “God Of Light” does well; it throws you into a stage covered by shadow but, by the end of it, you’re floating in a vibrant world that almost gets flooded by lights. It looks absolutely brilliant and I can’t imagine any way in which it could be done better. I don’t even really think my descriptive skills are at high enough of a level to truly explain to you readers the subtle but also obvious transition between the darkness and the light throughout the game. Clearly these folks know what they’re doing because they’re doing it damn well. This game is like a peanut butter and jam sandwich when it comes to how the audio and the visuals complement each other; neither is as good without the other, they just work together so well! While both of these aspects work great autonomously, they’re simply fantastic when working simultaneously. I believe it is simply because of immersion; the visuals literally give you a view of the world in which the game takes place in but without being able to experience the same world auditorally the feeling just isn’t the same. The music is also very hard to pin down as a genre or type, the best way I can describe it is that it uses a whole lot of light-hearted and fantasy-type tones to exactly portray that sense of whimsicality in which the visual style does its best to do. The music within was done by an electronic act by the name of “UNKLE”. It seems as though, even though I’ve never heard of them, they’re quite a “big deal” when it comes to music making. Regardless of whether or not I’m aware of these electronic artists, they created the soundtrack to “God Of Light” to which I’m not a big fan, I know hold “UNKLE” in quite a high regard and it was simply due to my enjoyment of “God Of Light”. I’ll keep this short and sweet: “God Of Light” is a fantastic game that ditches in-app purchases and replaces them with a one-off price of $1.99. 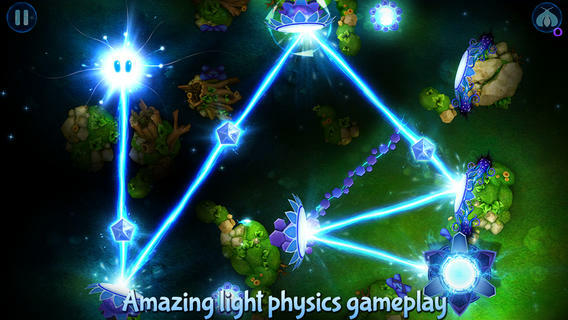 In-app purchases is a style of payment most puzzle game developers employ as a money making system but “God Of Light” doesn’t do this, “Eon Games” and “Playmous” simply want their brilliant game to be a form of enjoyment to players rather than a hassle and that’s something to be admired. Fantastic visuals, brilliant audio and a gameplay style that will keep you hooked to your mobile devices for ages. There really is nothing else you could possibly want from a game of its kind. It truly is a great source of light in a dense darkness.